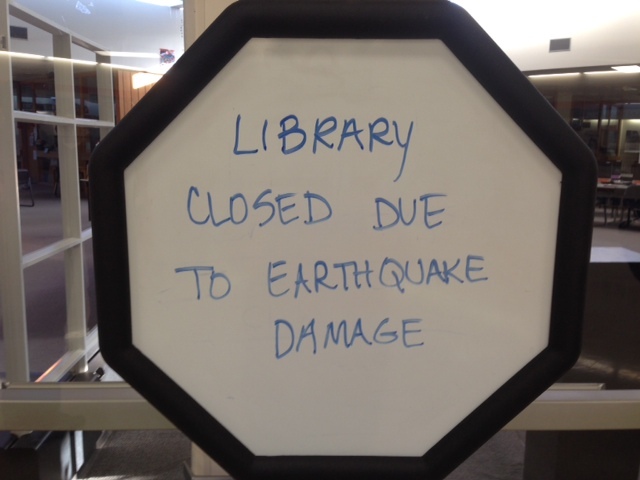 What a relief that no one was hurt in last week’s magnitude 6.2 earthquake that rattled Alaskans. There were three classes in the library that morning, in addition to about a dozen kids on individual passes. When the shaking started I was walking down the hallway with one of the groups, on my way to a budget meeting near the main office. 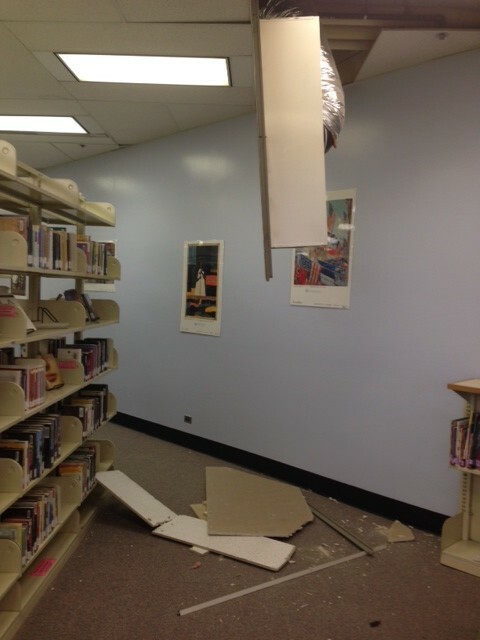 We initially thought the commotion was due to the construction that is currently taking place in our school. 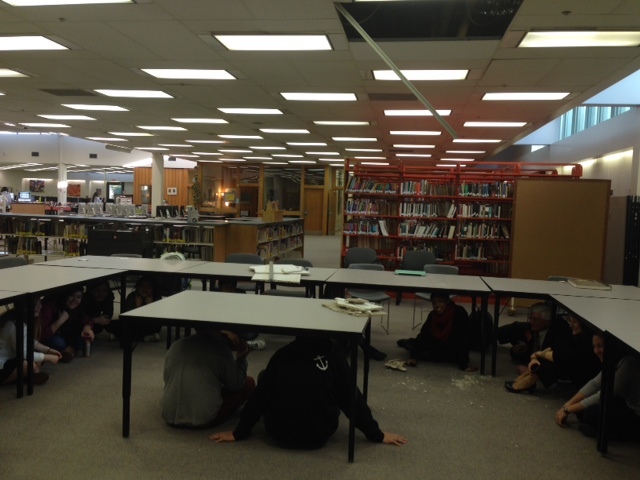 It was quickly apparent that the entire building was shaking and we were in the midst of a massive earthquake, so we got the kids into nearby classrooms and underneath door jams. 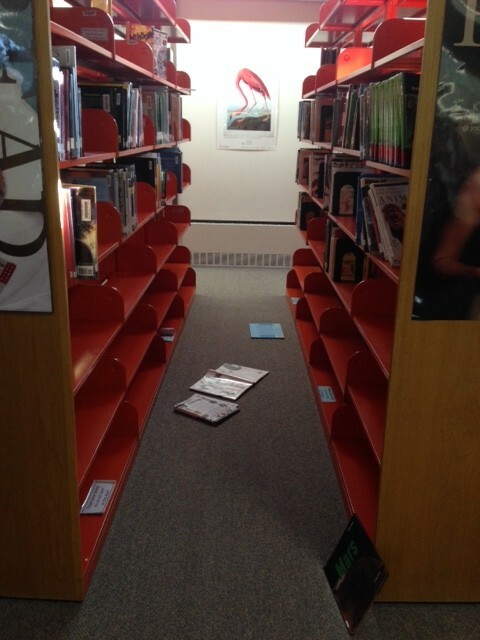 One of my principals was on the scene within moments, and he immediately evacuated the library. He declared that no one would be allowed to re-enter until the engineers could ensure the safety of the space, so we got everyone out and locked up the doors. I put up a sign and headed to the front office to wait for the maintenance crew to arrive. Our library is shared by both a middle and high school, so I sent an email to the teachers at both of my schools to let them know the library was closed until further notice. I attached my cell phone snapshots so they could see for themselves why we were evacuating. And while I was an evacuee I found a spare moment to upload a few pictures to Facebook as well. Fast forward 30 minutes or so. That’s how long it took for me to discover one of my photos – the one with the students crouching underneath the tables – was published on the front page of the Alaska Dispatch News website. They even gave me credit for the photo! It’s not like there was anything wrong or inaccurate with the photo, but I had not sent it to the media. No one asked my permission to use the image. So how did they get it? My Facebook account is private, but I knew someone on my friend list could have easily forwarded the image. I deleted my post about the earthquake, but it was too late. The image kept turning up everywhere. KTUU, our local television news station, posted it without any attribution. Honestly, I have no idea where else it was posted, viewed, tweeted, and shared. Nor will I ever know. In the after shock of the earthquake, I learned – firsthand – a very important lesson I have already taught hundreds of students during Internet safety presentations: Once you put something on the Internet, you lose all control. Later that afternoon I discovered how the photo went viral. Would you believe it wasn’t due to Facebook at all?! A teacher at one of my schools is married to a local journalist, and she forwarded my “Library Closed” email to her husband. She was sending the pictures as a wife to her husband, simply saying, “Wow, look what happened at my school!” and not as an undercover tip. I could choose to be angry, but instead I choose to appreciate her honesty. I’d still be wondering how that photo got out if she hadn’t approached me with the truth. I choose to accept that the mistake was actually my own, and I will never again email or share anything unless I’m comfortable with it seeping out of my control. It’s not like there was anything wrong with my viral photo, but as an educator I’m conscientious about posting student images online. I was worried parents might be upset at the image of children crouched underneath tables with debris falling above their heads, even though I knew everyone was safe. When the district posted the photo on its social media accounts I breathed a sigh of relief, because obviously that meant the communications department approved. More importantly, I choose to learn from this experience. I spent the evening after the earthquake collecting screenshots of all the places I found the picture published, and I plan to use them in my new and improved Internet safety presentations. Honestly, what good is any experience in life if you don’t learn from it? And most importantly, I choose to be grateful for the leadership of my principal, whose call to evacuate the library was absolutely correct. 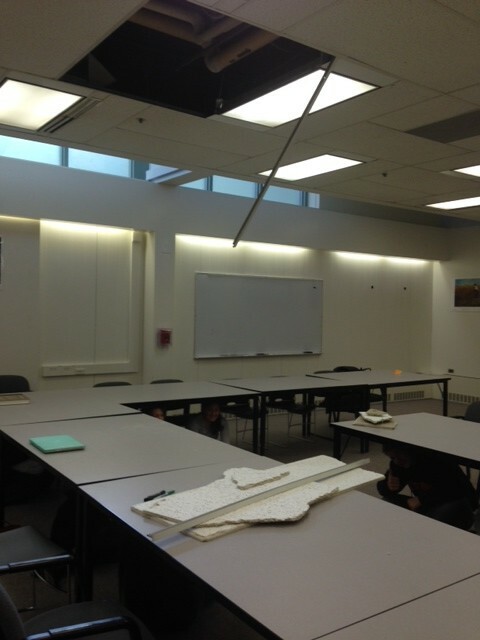 The structural engineers found additional issues and crews worked through the weekend so we could safely reopen our doors today. Our happy ending, after some important lessons learned! I am grateful for both!